Publications | The Reverend Anthony Jacob Henckel Family National Association, Inc.
Only Available New From The Henckel Family Association, used books occasionally can be found on Amazon and other websites, they are selling for between $150 to $250 depending on condition! The book outlines and discusses the seven branches of Anthony Jacob Henckel’s family, there is a branch for each of Anthony Jacob and Maria Dentzer Henckel’s seven children that lived to be adults. The book carries our family lineage from the 1500’s through the 1930’s. If your last name or any of your family members are Henckel, Henkel, Hinkle, Henkle, Hinkle, Geiger, , Kuhn, Apple, and hundreds more, then you are likely a descendant of the Rev. Anthony Jacob and Maria who arrived in America in 1717. The book is a must read for anyone that is starting a genealogical study or just wants to know more about their lineage and family’s history. We are the only source for new hard bound copies of “The Genealogy”. The price of the book is $85.00, including shipping and handling. Scroll down to the end of this page for ordering instructions. On Sale now $30 including shipping & handling!! The book is a fascinating account from the diaries and journals of the missionary travels of Rev. Paul Henkel and, his wife, Elizabeth Negeley Henkel. They traveled by horse and buggy through the mid-Atlantic states in the late 1700’s and early 1800’s. Their travels took them on trips to North Carolina where Paul was born, to Pendleton County, VA (now WVA) where he lived in his youth, and to Ohio, Tennessee, and Missouri where they helped to spread God’s word. Paul and Elizabeth’s home was in New Market, VA. New Market was the center of their ministry and home to The Henkel Press which for over 150 years printed materials for many the Lutheran Churches across the country. 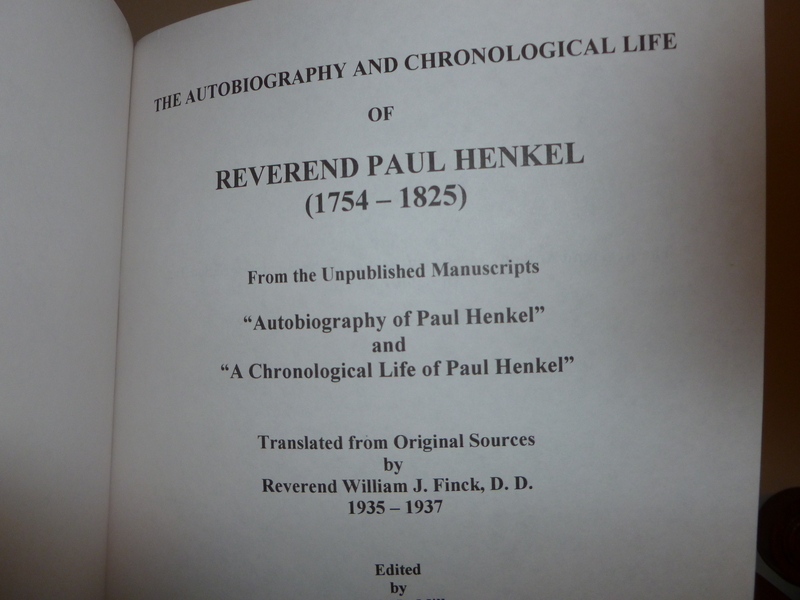 The diaries and journals of Reverend Paul Henkel were translated from German to English by Reverend William J. Finck, D.D. from 1935 – 1937; edited by Melvin L. Miller from 1991-1997; edited by Reverend Anthony Jacob Henckel Family National Association, Inc. Officers from 1999-2002; and published by Reverend Anthony Jacob Henckel Family National Association, Inc. in 2002. Copies of this book are only available through the Association and there is a limited supply. Please see address and instructions for ordering below. Available for a limited time at $30.00, including handling and shipping. Check should be made to: The Reverend A.J. Henckel Family National Assoc., Inc.
Be sure to include the address you would like the books to be shipped, if different from the address on your check! I would love to soon join and eventually buy the book. My ancestors are (1)Jacob and Maria Dentzer Henckel, (2) Jacob and Anna Henckel, (3) Anthony and Maria Hinkle, (4) Nathan and Rebecca Hinkle, (5) William and ? Hinkle, (6) Robert Hopkins and Elizabeth Hinkle Hopkins, (7) Benjamin Davis and Jennie Hopkins DAVIS, (8) Burrel Davis Sr. and Nellie Silvers DAVIS, (9) Burrel Davis Jr. and Hannelore Schúle Davis, and then me, Katharine Davis Dodson. Yesterday, I received “The Henckel Genealogy”. At this point I have not seen another copy of this book. Thank you for contacting your publisher. Thank you, glad you got the second mailing. If would happen to receive the first shipment, please send it back to sender and I will see that you receive the money, for returning it. Media Mail will cost about $5. Do not take it out of the box, just take it to Post Office and they will take care of return. As you suggested I contacted your publisher but, have not heard back regarding my copy of Henckel Genealogy. Maybe you should contact them and find out the problem. 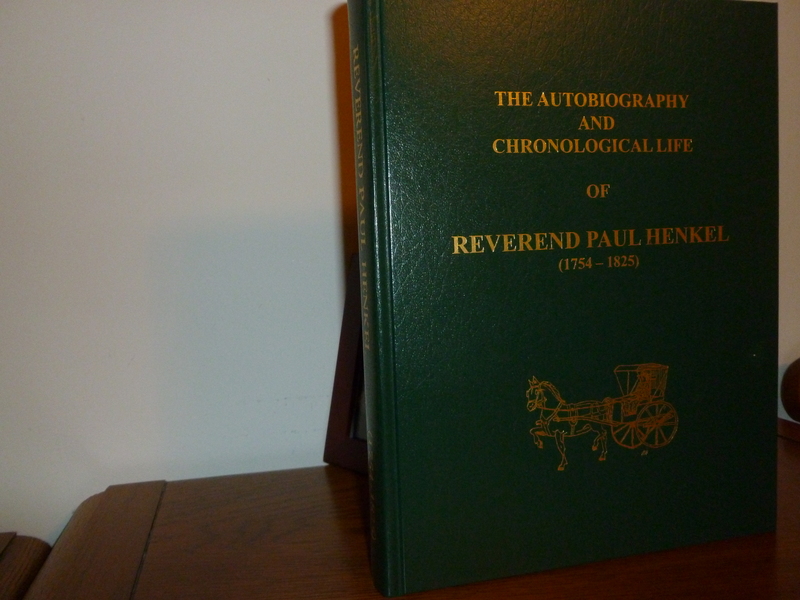 I received my copy of The Autobiography and Chronological life of Reverend Paul Henkel, however The Henckel Genealogy has not arrived as yet. Do you have any idea of when that might be shipped? I have talked with our publisher and he will ship you a second Henckel Genealogy this week. This is the first time Media Mail has failed to deliver. I understand from our publisher you live in California which means you may receive the first book in the future. in the future please go to contact us and send me an email, versus posting on our blog. It will get handled much faster that way. Sorry for the problem, please let me know when you receive the second and if you ever receive the first one. Are both of these books still available? Yes, they are still avaiable. I have the Junkins book, but my Elizabeth Hinckel (born 23 Aug 1752) is not in it. She married George Albrecht/Albright Bayer (most often used Albrecht/Albright) on June 26, 1770 in York, York County, PA. Albright was the son of Johannas Mathias Bayer and his wife Catharine (surname not found). The marriage of Elizabeth and Albright is recorded in the Stayers Lutheran Church in York, PA. She and husband lived in Newberry Twp, York Co, PA (a section of which later became Conewago Twp. They had 11 children and I have been able to find most of the births, baptisms, marriages and some of the spouses of the children in York Co, PA records. Elizabeth and Albright may be among the unidentified buried in the Quickel’s Cemetery, York Co, PA. Their union is recorded in The Genealogical Chronicles of an American Family (Fetrow-Fettrow-Fettro) (1719-1979), by Alan G. Fetrow, with the Journal of John Philip Fetrow given as the source. Therein the marriage date is July 6, 1770. Thank you for any help you can offer. The Henckel Genealogy available on our website would fill in the blanks in your Henckel family tree back to the early 1600’s. There’s a reference to “Gems of Henckel Memorabilia” in the ordering instructions, but there’s no description of it above. Is this item still available? If so, for how much? Gems of Henckel Memorabilia are no longer available. Should have been removed from our list of publications. My immediate family has lived in California since the 1940’s after WW2. Both of my parents were born in Oklahoma, I would love to hear from anyone I am related to. It appears that you definitely are a member of Branch V of our family, No doubt Catherine Henkle married Adam Biffle, according to The Henckel Genealogy they had a son John born ??? About all I can tell you from Genealogy. Your sources seem to be better than mine! Is the English-translation of the diary of Rev. Paul Henkel still available for purchase? He baptized many of my descendants at the Old Pine Lutheran Church in Mt. Jackson, VA, and later knew them in Mason County. Go back to our website by Googling: Henckel Family Association. At top of page hit Tab marked Publications, scroll down and you will find book and ordering instructions at bottom of page. I was told it was in Pennsylvania this year and possibly Staunton next year. I live in Fishersville, between Staunton and Waynesboro. Wish I’d of paid more attention, I would have cleared my schedule so my family could attend. I will try to make the Pennsylvania Reunion if all goes well. Hello; how much is the 300th Anniversary medallion? (it doesn’t specify on this site) Thank You! The Henckel Medallion is $30.00 which includes shipping and handling. Thank you for pointing out that I forgot the price on the Medallion when I posted that we ha just gotten a new shipment in! Hello, I would love to get the book and join the membership and wish I could have gone to the reunion in Staunton! But living in Delaware outside of Philly, will surely love to be in Germantown next year. Since Ancestry.com changed their format, some of my info may be incorrect but this is what I have. Hi Tammy. I went to the reunion this past weekend and found out I am in Branch II as well. Of the 150 people attending, only three of us were from Branch II. So that makes us distant cousins. I live in Roswell, Georgia near Atlanta. Where are you? My family eventually ended up in Kentucky in 1798 after my great, great grandmother, Elizabeth Hinkle, married my great, great grandfather, William Hart, in Augusta County, Virginia in 1798. I look forward to hearing back from you. I would really like to buy this book, but I’m not sure my family is from the same line. I have traced my family back to William Lazarus Henkel and Nancy Randall or Randolph in Tazewell, Virginia circa late 1700s. I had been told as a child that we were descendants of Pocahontas and the Randolphs of Virginia are in her line, but some histories have her dying without issue. If my family is linked to yours, I very much want to purchase the book and become a member but if we are of a different line, then the book does me no good at all. I would greatly appreciate any information you might have about this line. Thanks so much. I have all the information on Christian from her back to now an on the White’s…. 1. Rev. Paul Henkel in 1785 received a letter from Jacob Hinkle of North Carolina: “He was my father’s first cousin and already an old man.” Rev. Paul Henkel says Rowan County, but in 1785 Lincoln joined Rowan, and this is the only Jacob Hinkle in North Carolina to fit the description. 2. Joseph, son of Jacob, in a letter to [HG#527] Rev. David Henkel [son of Rev. Paul] calls him cousin. 21. Melvin L. Miller, edit., “The Autobiography and Chronological Life of Reverend Paul Henkel” (Reverend Anthony Jacob Henckel Family National Association, 2002), Inc., 29. Hello: Does anyone know if there is any information about the other 42 people that emigrated with Rev. Henkle in 1717 to Falkner’s Swamp? I am related to a Peter Conrad who owned land in Falkners Swamp and was a Deacon in the Lutheran church in 1717. I am running across information that says Rev. Henkle’s son-in-law, Valentine Gieger, was the first land owner and first settler in Falkner’s Swamp. I have found a description of Valentine’s land, which states it butts up to Peter Conrad’s land. So either Conrad bought at the same time, from Sprogell, or Peter Conrad was a land holder before Valentine. Would anyone have any further information or suggestions as to where I might look, online, for further emigration information or land information? Do you know where in Germany Anthony Jacob Henkle emigrated from? I’m thinking Peter Conrad would probably have been a neighbor, if he emigrated at the same time. Thank you for any help you might think of. Take a look at New Hanover Lutheran Church’s history. You will find that there were people living in the Falckner Swamp before 1717. Anthony Jacob Henckel was the 3rd pastor of the church which was founded around 1700. At one time, I thought I had read on this website that pamphlets for each branch of the Henckel family were available. I would be looking for the sixth branch. Do you have any of these available? We do not have pamphlets on the Branches of our family. The Henckel Genealogy by Junkins and Junkins is the source for this type of information. It outlines each Branch up until the 1930’s, so you will need to know a relative born prior to then to find your lineage. In my case my dad was born in 1923 so it was fairly easy. The books are available. as you probably noticed under publications. Thank you for your comment, as I said in e-mail I just sent you i will correct the instructions for ordering on the site. I look forward to seeing you in Staunton on June 17 at our annual reunion. Just curious. My husband and his family appear in the big “Red” book (of which we have a copy from his grandfather, Grover J. Hinkle). We noted some missing and erroneous information. How might we present corrections that may be included in future printings (obviously not for the printing coming up in the next month or two)? We have no control over the contents of the book and cannot correct mistakes in it. I recent found a similar problem by accident. However, my families history is extensively covered and right on! Thanks for your comment. Any copies left? My ggreat grandmother was Rebecca Henkel Funkhouser.. I have an exact date for shipment so you can pre-order. There are no other legitimate sources for the book other than our Association. Sometimes there are used copies on Amazon and other places at ridiculous prices, usually over $200, that are in very poor shape. If you are not a member of our association, we would like to have you as a member. Our next Reunion is in Staunton-Waynesboro, VA – June 18,19,20. I grew up there and had a couple of friends that were Funkhousers! We are planning to be at the 2016 family reunion in Staunton. Temperance Valentine Hinkle is Rob’s Great Grandmother. We know so very little of the Hinkle family, only what we find on Ancestry so are really excited about the reunion. Beverly, we look forward to seeing you and Rob at the Henckel Family Reunion in Staunton, VA June 17, 18, 19. I am sure that you will learn more about your Henckel side of rob’s family at the Reunion. I look forward meeting you and seeing any of the relevant information you have collected from Ancestry.com. Hope you have used our tips on finding out which Branch of our family Rob is decedent from that are available on this website. Lynnette Kay Patterson (Sullivan) (1945- current). Was Rev Paul Henkel a son of AJ Hinkle III ( 1735-1814)?? The Rev. Paul Henkel was the son of Jacob Henckel (changed spelling to Hinkle as an adult). Jacob was the son of John Justus Henckel. See the PUBLICATIONS TAB if it is list it is available. When not available it will not be on website.